The field of quantum science and technology experiences an ever-intensifying flurry of activity. The headlines are currently dominated by reports on progress towards building quantum computers that outperform their classical counterparts at specific computational tasks. A key challenge in that quest is to increase the quality and number of basic building blocks — known as quantum bits, or qubits — that can be connected to perform collectively quantum computations. The benchmark where a 'quantum advantage' is expected to emerge is at 50 or so qubits, and that goal is coming into sight. Pursuing a different route, a team including ETH physicists Andrey Lebedev and Gianni Blatter, together with colleagues in Finland and Russia, highlight another branch of technology where quantum devices promise unique benefits, and that with considerably more modest hardware resources. 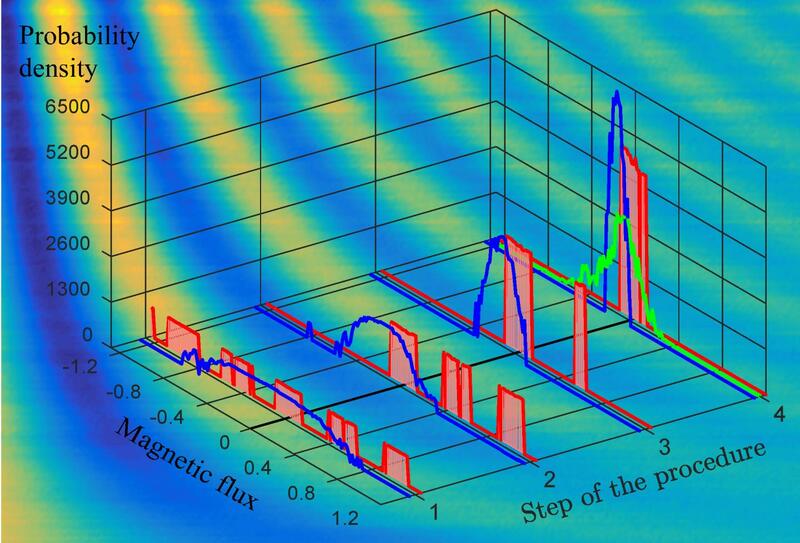 Writing in the journal npj Quantum Information, the team presents experiments in which they used a single qubit to measure magnetic fields with high sensitivity, employing 'quantum trickery' to push the limits. In their work, the team used a qubit based on a superconducting circuit. The so-called transmon qubit is currently one of the leading candidates for a building block of large-scale quantum computers, not least as it offers numerous freedoms for engineering the circuits in ways that suit the problem at hand. Researchers at Aalto University (Finland) have now taken advantage of this flexibility and built a transmon qubit in a configuration that makes it particularly suitable for sensing magnetic fields. In essence, they constructed an artificial atom with an intrinsic magnetic moment that is around 100'000 times larger than that of natural atoms or ions. The coupling of that large moment to an external magnetic field then makes it possible to accurately measure the strength of the field. In addition to providing a strong coupling to a magnetic field, the transmon qubit has a defining property of a quantum system on offer: coherent superpositions of quantum states. In a qubit-based magnetometer, the coherence between two states oscillates at a frequency proportional to the magnetic field penetrating the device. And the higher the accuracy with which the frequency — or, the rate at which the phase of the wavefunction changes — can be measured, the higher the sensitivity of the sensor. To maximize the measurement accuracy, the team, guided by theoretical work performed by Lebedev and Blatter at ETH Zurich and co-workers at the Moscow Institute of Physics and Technology (MITP) and the Landau Institute for Theoretical Physics in Moscow, implemented two dedicated phase-estimation schemes that explicitly exploit the coherent nature of the qubit dynamics. Their strategy is to perform the measurements in an adaptive manner, changing the sampling parameters depending on the outcome of antecedent measurements. Such 'Bayesian inference' enabled the team to reach in their experiments a sensitivity that is some six times higher than what can be achieved with classical phase estimation. And whereas there is still plenty of room for refinement, that 'quantum boost' was already sufficient to beat the shot noise, which limits the precision of any standard, classical measurement. The phase-estimation algorithms used in the transmon experiments are suitably adapted versions of schemes that have been developed for use in quantum computations. Similarly, the design of the hardware used in these experiments draws on experience in building qubits for quantum computers. This combination of harnessing quantum hardware and quantum algorithms in the context of quantum sensing provides an appealing route towards novel devices that, ultimately, promise to push the sensitivity of single- or few-qubit magnetometers towards and beyond the limits of current magnetic-field sensors.